Sharing high quality content with followers is absolutely key to social success. It not only increases your reach by providing value to your fans, followers, and friends, but also encourages engagement with customers by acting as a catalyst for discussion and the building of relationships. If your business really wants to connect with customers on social media, your content is the means to get there. Unfortunately, finding good content is often a time-consuming and difficult task. With so many businesses facing this challenge, the newly launched Hootsuite Labs has created a powerful new feature to help you save time on content discovery and social media publishing. This new content suggestion feature analyzes your posting history on Twitter and recommends articles that are relevant and interesting to you, your followers and friends. It then places them into the prime spots within your content calendar for easy editing and publishing. 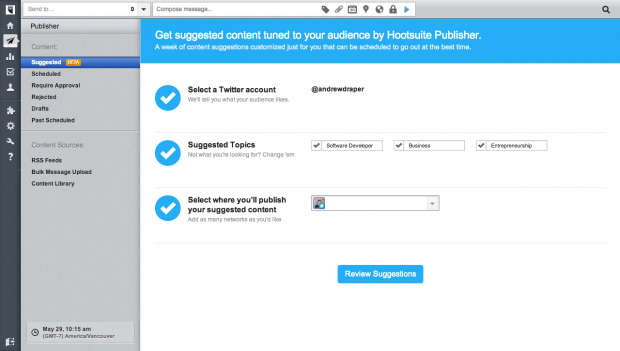 Hootsuite’s newest feature, Suggested Content, is being released into BETA today. 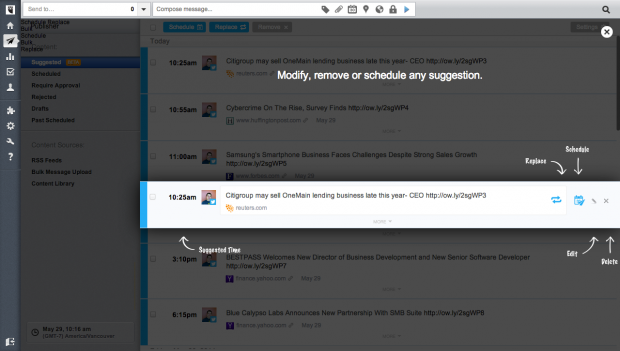 Hootsuite Pro and Enterprise customers will gain access to this new feature in a phased rollout beginning immediately. 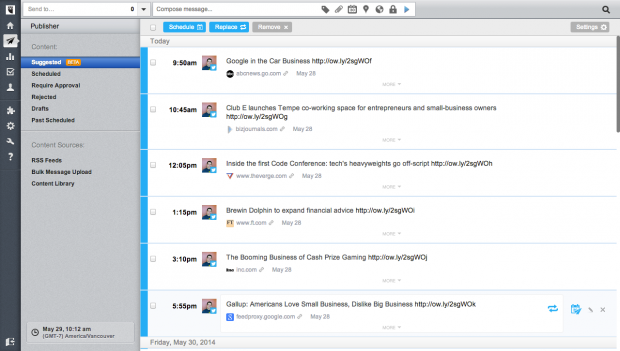 Sign up for a free trial of HootSuite Pro today! A look at the suggested content feature during its first run within your dashboard. 2) Hootsuite will scan your previous Tweets and Twitter profile, and suggest three content categories based on what it finds, which you can approve or change. 3) Once you’ve determined your categories, Hootsuite will analyze your topics and posting history. When it finds relevant content, it will then create a scheduled list of social messages pointing to it. These messages will appear in optimal time slots within your content calendar. 4) Review the Tweets. Look at article previews to make sure the content is up to par, and then edit any of the messages to meet your desired tone of voice and structure. As you tweak, edit and refine your content, Hootsuite learns what you like and provides even more precise content for you. Articles can also be replaced with a different post by clicking the “replace” button at the top of the screen. 5) Then—one-by-one or in bulk—delete or schedule the messages of your choice. Imagine a small sports equipment store with only one location. They don’t have the resources to assign anyone to manage social media full time, let alone find relevant content for Facebook, Twitter, Google+, LinkedIn and other networks. This store owner can now sign into Hootsuite whenever they have time, get suggested content about professional sports, local teams and new equipment, and schedule posts for the entire week. Then, they can dedicate their free time to engaging prospects and clients that they’ve earned by sharing relevant content. This new feature is also smart—the more you use it, the more it learns about what content you like to share. Plus, it optimizes your scheduling, so you can maximize engagement with your followers. This new time-saving tool isn’t a replacement for engagement; businesses that have the resources can easily find and share great content from wherever they are on the web with a tool like the Hootlet. This feature is simply a way to speed up one of the most time-consuming parts of your social media strategy when you need to. Now you can spend more time replying to followers and attracting new ones rather than surfing the web looking for the next article to share. Login to your Pro or Enterprise account over the next week to try out the free BETA! If you don’t have an account, then sign up for a 30-day trial of Hootsuite Pro.